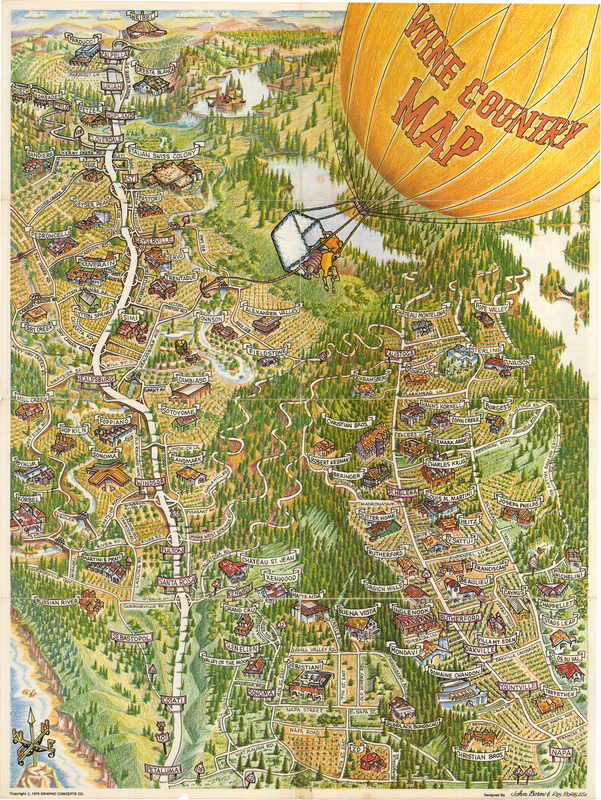 This colorful and fun pictorial map offers a bird’s eye view of the wine country of California including 75 wineries in Napa, Sonoma and Mendocino counties. A hot air balloon carries a group of three passengers sailing over the scenic countryside which produces more than 90% of American wine. The map makes a marvelous guide to visiting the area as the vineyards and wineries themselves are depicted pictorially, along with names of cities and towns. Major highways and side roads of the day are pictured and numbered. Telephone numbers for each winery are provided, and information regarding the services provided by each is shown in an easy to read format accompanied by a legend. To make the organization of one’s trip even easier, a mileage table is also provided on the verso. Condition: This map is in A- condition with a few minute separations on folds and a small chip from the lower edge.